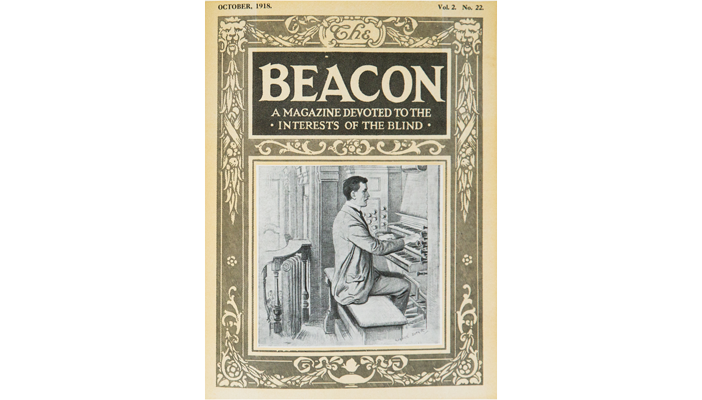 The Beacon was printed monthly and over the years, there were many beautiful hand-drawn illustrations used on the front cover. Not every month had a different illustration but between 1917 and 1918 there were quite a few new front covers. After 1918, the front cover was standardised for years but there were still illustrations used in some of the features. Photographs were also used. Here are some of the more ornate covers from the first two years of The Beacon. The first few editions of The Beacon all had this front cover. The style was to have hand-drawn illustrations and ornate borders. By June 1917, the illustration on the front cover had changed. The illustration shows a little girl smelling a flower and a younger boy. The line drawing has birds in the background. This edition focused on children and young people. The August 1917 front cover depicted a young lady reading braille. She wears a smart blouse and the caption on the illustration says 'The fingers that see'. The back page on the magazine shows adverts. One advert is for hospital beds for soldiers in Birmingham. The Christmas edition in 1917 was the only version to use a colour illustration on the front cover. The illustration is of a lady giving a little girl a gift with other children in the background and a border of holly.